Japanese earth atmosphere satellite. Greenhouse Gas Observing Satellite, renamed Ibuki after launch. AKA: GOSAT. Status: Operational 2009. First Launch: 2009-01-23. Last Launch: 2009-01-23. Number: 1 . Gross mass: 1,750 kg (3,850 lb). The satellite carried a spectrometer and cloud and aerosol imager to allow accurate measurement of the carbon dioxide content of the atmosphere at different altitudes on a global basis. IBUKI was equipped with a greenhouse gas observation sensor (TANSO-FTS) and a supplementary cloud/aerosol sensor (TANSO-CAI). The greenhouse gas observation sensor observed a wide range of wave lengths (near infrared region ~ thermal infrared region) within the infrared band to enhance observation accuracy (up to 18,500 observation channels. The cloud/aerosol sensor simultaneously observed clouds and aerosol that could lead to errors in the measurement of greenhouse gas if not taken into account. Family: Atmosphere sat, Earth, Sun synchronous orbit. Country: Japan. Launch Vehicles: H-II, H-IIA 202. Launch Sites: Tanegashima. Agency: JAXA. Ibuki - . Payload: GOSAT. Mass: 1,750 kg (3,850 lb). Nation: Japan. Agency: JAXA. Manufacturer: Mitsubishi. Class: Earth. Type: Earth resources satellite. Spacecraft: Ibuki. USAF Sat Cat: 33492 . COSPAR: 2009-002A. Apogee: 672 km (417 mi). Perigee: 669 km (415 mi). Inclination: 98.00 deg. Period: 98.20 min. 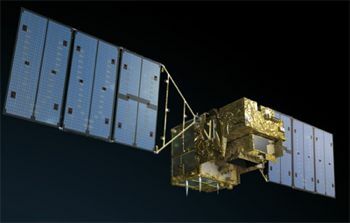 Greenhouse Gas Observing Satellite, renamed Ibuki after launch. The satellite carried a TANSO-FTS IR spectrometer and TANSO-CAI cloud and aerosol imager..